Read the second draft of this story here. To say the house killed people was perhaps a bit of a misnomer. It really more trapped them. Although, they certainly ceased to be alive, but they weren’t exactly dead either. Molly knew something had to be wrong with the house as soon as she saw the listing on eBay. A house that size, for that price, in that neighborhood? She wanted to see it for herself, so she drove by it… several times before she finally figured out that the overgrown forested lot she kept passing actually sheltered a house within. Ah, she thought. That’s the problem. Nothing a little landscaping couldn’t fix. She bid on it and won! Of course, she was the only person who bid on it. Not long after she moved in, she discovered the real reason for the low price and motivated seller. But after a few nightmarish weeks, she and the house arrived at a truce. She stopped trying to redecorate or help people, and the house left her alone. They rounded the corner and approached the house. Even at night, the house seemed darker than the rest of the block. 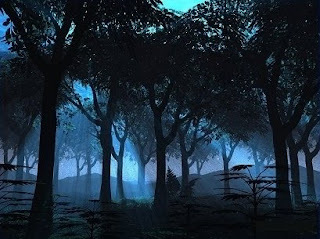 The tall trees blocked out the moonlight and the bushes and branches blocked any stray beam of light that might have been generated from within the house by a power strip or a microwave oven. Molly had no outside light and she never left lights on when she wasn’t there. The house wouldn’t allow it. They stopped in front of where Molly knew the pathway to the front door started. Martin kept trying to pull her down the block. “Come on. Someone might see us,” he said. “Ow!” Martin stepped on a twig in an awkward way. Molly knew the way by heart. She’d memorized it carefully in the daylight long ago. It wasn’t a direct route from the sidewalk to the door, nor was it the only route, but it was the safest and marginally most direct. Martin felt as though he were suddenly on a very bizarre teambuilding exercise at work. One of the ones where they blindfold you and have your coworkers lead you around to help teach you trust. He quietly thanked the universe that they didn’t make you do those naked. Molly’s heart kept trying to make a break for it. She wished she weren’t naked, just so she could have an extra layer on to hold it in, but she focused on the task at hand and soon they were to the front stairs with only a few minor cuts and scrapes from the underbrush. “Wait here. Don’t move. There’s some nails jutting up on the stairs. I know where they are, but you don’t. I’ll go get you some boots to put on or find a flashlight or something.” He let her hand slip from his and felt her glide up the stairs and into the house. He might as well be in a sensory deprivation tank, he thought. He couldn’t see anything. His feet slowly sunk into the soft ground covering of long fallen leaves and moss. They felt cold and yet he didn’t feel like picking them up or stamping them around to keep them warm. They were fine just where they were. If he relaxed he could feel the coldness from the ground creeping up the backs of his legs to his spine. It was almost like a cold water massage, which you wouldn’t think would be appealing, and yet it was. He couldn’t quite tell if he was still standing. The blackness so completely enveloped him that he had no reference point. He didn’t know which way was up or down or sideways or spinning. Maybe he should put a hand down to steady himself, but which way was down? “Here you go.” A shoe out of the darkness thrust itself into his hand, and then another. “Oh.” Martin could see the faint outline of Molly, still naked standing in front of him. He pulled his feet up with more than a little effort and forced on the slightly too small boots. Molly led him up the stairs and into the house. She clicked on a light and creaked the door closed behind them. Everything seemed to have turned sepia-toned, as if Martin had just stepped out of Oz into Dorothy’s house. The entryway had paisley wallpaper down half the wall, a chair rail, and then knotted pine paneling down to the hardwood floor. A dark mahogany hall butler stood sentinel by the door with a few light jackets and a scarf hung of its iron hooks and a handful of shoes at its base. He and Molly stood in a tiny pool of light thrown down by a strange flower shaped fixture stuck in the beige ceiling. He looked off down the hallway, but couldn’t see anymore of the house. “Nice,” he said, unsure what else to say, and pried off the undersized boots. “No, I like it. Very homey.” He thunked the last boot on the hall butler and felt the cold smooth floor under his feet. “Let’s get some cloths.” She made a move down the hall, but he turned her around by the hips and pulled her close to him. The house made a loud creak and groan in the night wind. “Come on, let’s go.” Molly pulled on his arm. A great storm of leaves blew after them, and the house screeched loudly in the wind.